Hours after Zimbabwe’s ruling party voted to oust Robert Mugabe as its leader, the embattled president addressed the political turmoil in the African country in a speech to the nation — but did not say he was resigning. In an extraordinary meeting of the Zanu-PF party's central committee earlier Sunday, it replaced Mugabe with the deputy he fired earlier this month and dismissed first lady Grace Mugabe as head of its women’s league. The party gave Mugabe a deadline of noon on Monday to resign as president or face impeachment. So when the 93-year-old Mugabe addressed the nation Sunday from the State House while surrounded by military officers, in a speech broadcast on the state-run Zimbabwe Broadcasting Corporation, it was widely expected that he would announce he was stepping aside. Instead, Mugabe, in a rambling 20-minute address, noted that he'd met with the nation's security forces on Sunday following a military operation over the past week when he was held under house arrest. "Today’s meeting with the command element has underscored the need for us to collectively start processes that return our nation to normalcy," he added. "We cannot be guided by bitterness or vengefulness, both of which would not make us any better," he said. Mugabe added that he would be presiding over the Zanu-PF's congress in December. Prior to his remarks, both The Associated Press and Reuters reported that Mugabe was resigning, each citing a officials close to the negotiations. If Mugabe does not resign, impeachment proceedings would begin when parliament resumes on Tuesday, Cyber Security Minister Patrick Chinamasa said earlier Sunday. Members of the ruling party’s Central Committee stood, cheered and began to sing as the process of recalling Mugabe as leader began. Meeting chair Obert Mpofu referred to him as the "outgoing president." Zimbabwe opposition leader Morgan Tsvangirai said he was "baffled" by Mugabe's address to the nation. "I am baffled. It's not just me, it's the whole nation. He's playing a game. He has let the whole nation down," Tsvangirai told Reuters. By Sunday night, the chief whip of the ruling party told The Associated Press: "I don’t see us failing to proceed with the impeachment." "The Central Committee decision stands until I am advised otherwise," Lovemore Matuke said. Emmerson Mnangagwa, whose ousting from his vice presidential post nearly two weeks ago led to the military seizure of power, was chosen as the Zanu-PF party’s new leader. A former state security chief known as "The Crocodile," Mnangagwa is expected to head a new government after his formal election as ruling party chief next month. Mnangagwa, 75, is a former Mugabe ally who earned his reptilian nickname after leading a group of fighters called the Crocodile Gang during the country's war of independence in the 1960s and 70s, Voice of America reported. He was sentenced to death for blowing up trains in the 1960s but was never executed because of his young age. Related: Mugabe makes post-coup appearence — but where's 'Gucci Grace'? The ruling party said he should be its nominee to stand for presidential elections next year. Without the military’s intervention, Grace Mugabe would have likely replaced Mnangagwa as vice president and been in a position to succeed her husband. The party accused her Sunday of "preaching hate, divisiveness and assuming roles and powers not delegated to the office." Zimbabwean officials have not revealed details of Mugabe’s talks with army commander Constantino Chiwenga, but the military appears to favor a voluntary resignation by Mugabe to maintain a appearance of legality in the political transition. Mugabe, in turn, could be using whatever leverage he has left to try to preserve his legacy as one of Africa’s liberation leaders or even protect himself and his family from possible prosecution. Southern African leaders said they would hold a regional crisis summit on the situation in Zimbabwe, in Angola on Tuesday. 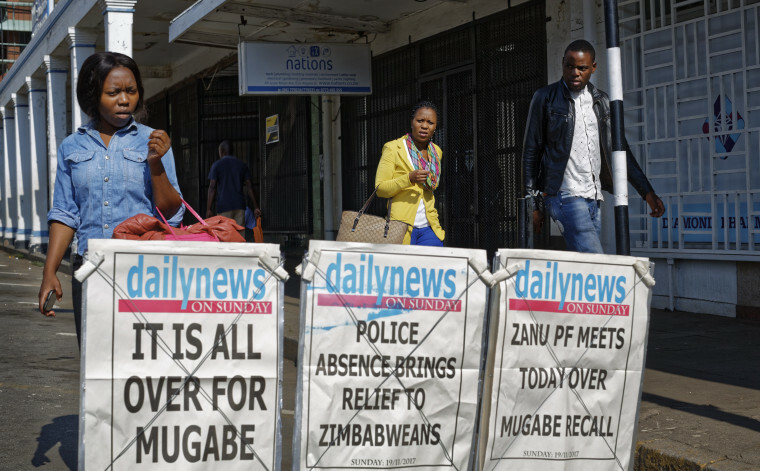 The developments came a day after euphoric crowds rallied peacefully in the capital, Harare, for the long-time president’s resignation. Many people on the streets heralded the developments as a “second liberation” for the former British colony and spoke of their dreams for political and economic change after over two decades of deepening repression and hardship.